The picture may sound funny, but think of ‘How True & Implied’ it is when been being as part of a very ‘good’ team….. 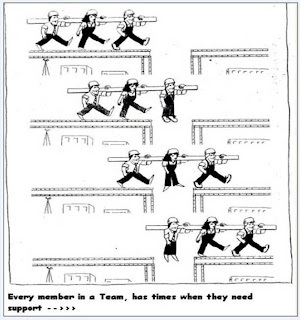 Team work does matter and it results in fruitful results – always. Who wants to deny this fact? I believe no one can!! don't get me wrong.. it just occured to me when i saw the last guy hanging.. what if he was really fat n the other 2 couldn't bear his weight? n don't try to control it, let it out.